Here is another trophy animal that I had no intention of hunting before I arrived at Fort Richmond Safaris. It is a red hartebeest. Frankly, looking at pictures of them, I thought it looked kind of stupid. However, I was present when Linda Powell took her hartebeest and had the chance to examine it up closely. The hide is beautiful and the horns are impressive. Grilled hartebeest backstrap is mighty appealing, too. We looked over several herds of hartebeest and I realized that my shot, if I took one, was going to be on the long side…”Way out past Fort Mudge” as Col. Cooper used to say. These rascals stay out on the wide open prairie and change zip codes whenever they see anything remotely suspicious. I did just that and punched his shoulders, breaking the off shoulder. The rifle used was an old BRNO 7×57 with a Leupold 3×9 scope. Ammo was a handload, using Sierra bullets…162 gr softpoint, as I recall. This is an old bull with a truly massive set of horns. I’d say that he must weight about 450 pounds. These critters are tough to hunt and tough to put down. Oh, and they no longer look stupid to me. 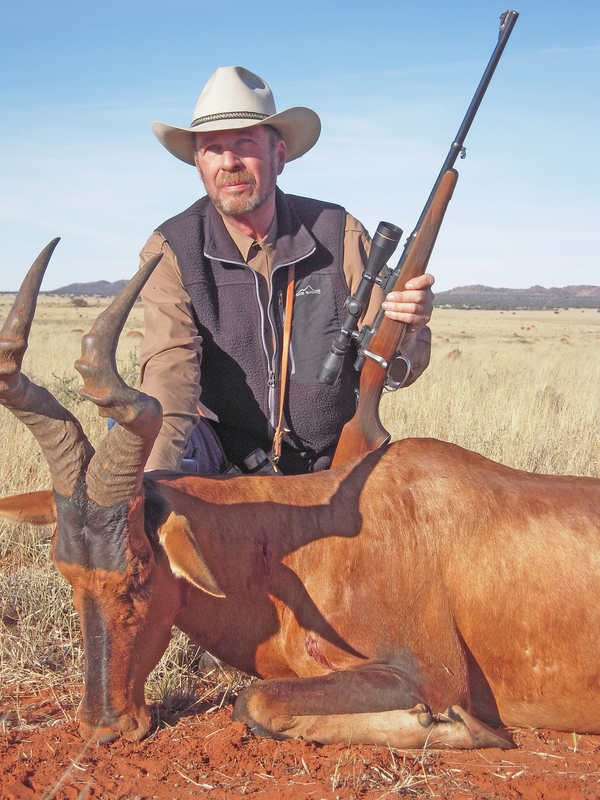 This entry was posted in Adventures, Hunting, Rifles and tagged 7x57 mauser, africa, BRNO, col. jeff cooper, Fort Mudge, fort richmond safaris, game animals, Linda Powell, red hartebeest, woodscraft. Bookmark the permalink. Magnificent looking animal, Sheriff. That hide looks very impressive, perhaps the basis of some new gunleather in the near future? Bet it wont hate them. Hello sheriff. This article made me think about Finn Aagaard. Did you ever meet? Good hunting.